my take: I was having lunch with a new friend and when the convo got around to books (as any good convo will) she first suggested a book everyone should read. I whipped out my iPhone and took a note. When I mentioned it to another friend later (a very granola, earthy woman) she said she didn't like things titled "anti." Which I can see - anti isn't very life-affirming. Which the book is. A better title? I can't think of one. "All of us have cancer cells in our bodies. But not all of us will develop cancer." 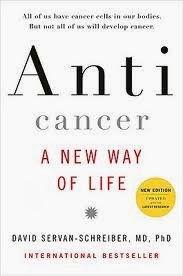 The author (a medical doctor) has had cancer and this is his approach and "new way of life." He readily admits that not all of his suggested practices have been double-blind studied, and he says none of the things he's recommending will in any way harm you. Some are very easy: eat broccoli (or from the cruciferous family) three times a week and drink lots of green tea. There's a great, colorful insert with all the dietary and environmental tips. Read this so you've got the knowledge in the back of your brain for if you or a loved one ever need the information ... and read this so you can begin preventing the cancer cells in you from needing medical intervention ... and read this if you are in treatment for cancer. Do it. Seriously. Please.